One does it all, the other is more focused -- diversification is probably best. Oil and natural gas prices play a big role at ExxonMobil (NYSE:XOM) and ConocoPhillips (NYSE:COP). But these two energy industry players have very different businesses overall. Which one is a better choice for your portfolio? Let's take a look. The biggest thing ExxonMobil and ConocoPhillips have in common is oil and natural gas, which is the core of each company's business. That said, exploration and production is all that ConocoPhillips does, but it's just one part of ExxonMobil's portfolio, which also includes refining, chemicals, and selling a broad array of end products to customers via its global distribution network (more on these businesses later). And while there's definitely a size difference here, both are global players. ConocoPhillips is a "tiny" $65 billion market cap company compared to ExxonMobil's giant $380 billion market cap. As for footprint, ConocoPhillips has operations in around 15 countries compared to ExxonMobil's 24. Where ConocoPhillips operates. Image source: ConocoPhillips. ConocoPhillips has actually been refocusing around fewer properties lately, using asset sales so it can work on only its best assets. But it still does business in countries as far-reaching as Norway, China, Libya, and Brunei. And the law of large numbers means it's easier for ConocoPhillips to grow its business than for ExxonMobil. So smaller isn't necessarily a negative. All of that said, ExxonMobil stands out in some key ways. For starters, its operations are much broader than just drilling for oil and gas. That's a positive because it has a more balanced business. Most recently, falling oil prices hit the exploration side of its operations hard in 2015, but its refining business benefited from lower costs for a key input (oil). Refining profits helped soften the blow from the drilling side of things. ExxonMobil's diversification helped to limit the damage from falling oil prices. Image source: ExxonMobil. That diversity is one of the reasons ExxonMobil has been confident enough to keep increasing its dividend through the oil downturn. ConocoPhillips cut its dividend by around two-thirds at the start of 2016. ExxonMobil simply has more levers to pull to support its financial results. At the time of the cut, ConocoPhillips' CEO Ryan Lance cited preparing for "lower prices for a longer period of time." Since the company is focused only on the oil and gas business, that was probably a prudent move. But it clearly falls well shy of ExxonMobil's impressive 34-year streak of annual dividend increases. To be fair, you can't talk about that dividend streak without mentioning that ExxonMobil has been adding debt to support its business, and dividend, through the downturn. ConocoPhillips, on the other hand, has made debt reduction one of its top priorities. The two, however, are in vastly different balance sheet positions. Long-term debt makes up just 15% of ExxonMobil's capital structure even though debt rose by roughly 45% through the first nine months of 2016. ConocoPhillips' long-term debt is nearly half of its capital structure. And then there's execution. As noted above, ConocoPhillips has been focusing on its best properties, in an attempt to improve its margins. 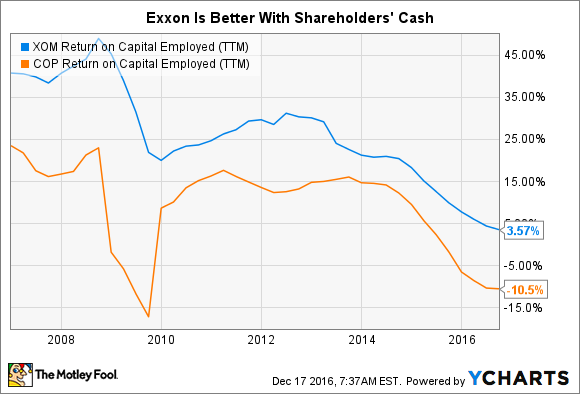 However, over the long term, ExxonMobil has been a better steward of its shareholders' capital, besting ConocoPhillips on return on capital employed (ROCE) over each of the last 10 years. ExxonMobil generally sits atop the energy industry when it comes to ROCE. When you sum it up, ConocoPhillips is a fine company, but it's more of a pure play in the energy space. If you're looking to invest based on where you think the direction of oil and gas prices will go, that could be just what you are looking for. However, long-term investors would be better off sticking with ExxonMobil. It's more diversified, has a stronger operating history, is in a stronger financial position, and it has done a better job returning value to investors through regular dividend increases.